Aircel, India’s 5th largest GSM service operator with a market share of just over 9.5% announced the launch of exciting MEGA CONSUMER OFFER for its prepaid customers in Uttar Pradesh (West) telecom circle. The existing Aircel preapid subscribers can get a REEBOK SIPPER Worth Rs 299 FREE on recharge of PoketInternet 98 (worth Rs.98) or Any recharge of Rs 100 and above with in the offer period. While new Aircel subscribers can get a the same on the First Recharge (FR) of Rs 47and Second subsequent Recharge is of Rs 30. The total value of First Recharge + Second Recharge is more than Rs100. The offer open till 20th Nov 2010 or till stocks last!! 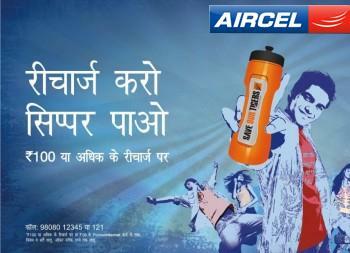 For more details visit Aircel Stores or dial 98080-12345 or 121 from Aircel Mobile. which districts are covered in U.P.west ? Kudos to Aircel for launching such an exciting proposition for consumers!!! Its the only telecom company which is offering exctiting propositions for not just retailers but for end users as well!! !